annie in swaziland: We'll see you again in May!! We'll see you again in May!! Due to pressure from the international community, the Swazi government has started to offer “free” primary school education. But while it costs around $250/student per year to offer decent education, the government in years past used to pay $80/student per year for grades 1-5. This year they decided (due to pressure) to add grade 6 for free but now only is able to pay $58/student per year for grades 1-6 leaving the school in even more of a deficit. 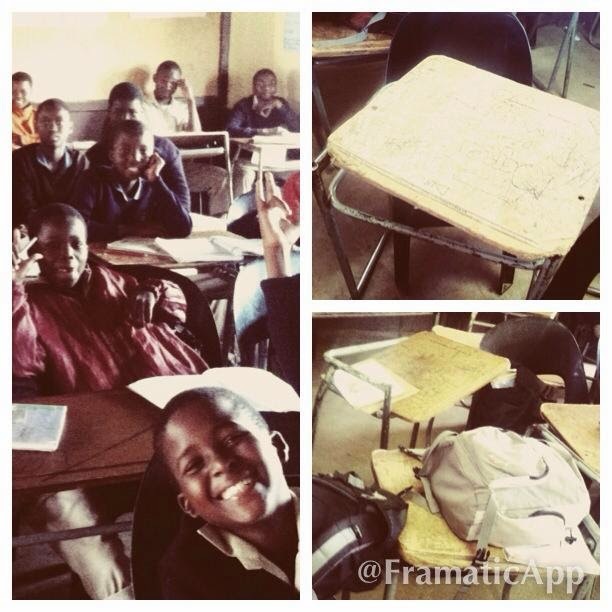 As a result, at eLangeni, Grade 7B had no desks. Kids in 6A were sharing chairs. All children (as young as 5 years old) have to carry their desks and chairs from room to room (ie science to English literature) making multiple trips therefore taking away valuable class time. The picture is intense…no chairs, broken desks, no food, teachers not getting paid…even if 40 students are in a classroom, that makes $2,400 for the YEAR for desks, chairs, teachers’ salaries, school structure upkeep, uniforms, food, and supplies (textbooks, chalk, notebooks, national exam fees, etc). This is simply impossible. The deputy teacher asked us to provide the students with new desks and chairs (US $3,087). Afterward, we took our sponsored orphaned boys out to purchase essential hygiene products, to dinner (with MEAT! ), and to lick KFC soft twirls (Katy, you are jealous right now). They tried to teach us a Swazi card game called Casino but we never quite caught on…. I could have taught them a mean game of Old Maid though!! Goodbyes are hard but Kait and I are excited to see them in May!! Siyabonga (Thank you)!! …for everything.